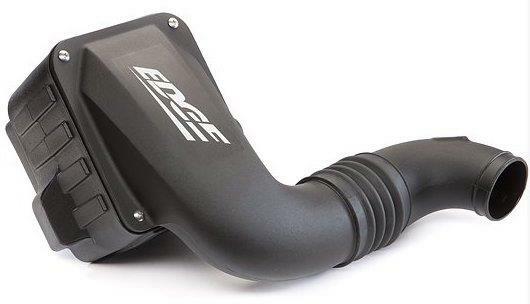 Edge Products Jammer Cold Air Intake - Dezod Motorsports Inc - Home of the automotive performance enthusiast since 2002. Introducing Edge’s all-new Jammer Cold Air Intake (CAI) systems. The Jammer Cold Air Intake’s revolutionary design improves airflow by blocking hot air and using cooler, denser air for optimal efficiency. Edge performance tuning, combined with the Jammer Cold Air Intake, offers best-in-class results for maximum performance, and improved continuous power. How it works – The Jammer Cold Air Intake design was engineered to move the intake box away from the engine’s heat to reduce warm air flow and catch the cooler outside air. Moving the air filter helps capture the outside cooler air that can be sucked into the engine for combustion. Cooler air brings more oxygen (denser air) into the combustion chamber and that means more power. When combining cooler more dense air to the engine you are able to have a more efficient combustion as well as add more fuel equaling more power. The Jammer Cold Air Intake uses a large diameter intake tube that is smoother, has less bends and wider providing uninterrupted airflow. By itself, you’ll notice an increase in power and especially when the throttle is fully open. Team up the Jammer diesel intake with other Edge performance products and you’ll create a much more efficient system with maximum gains in power, mileage, and efficiency.